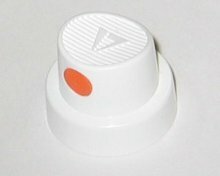 Orange Dot Fat Caps aren't as ridiculously loud as Pink Dot Fat Caps. They are wider than NY fats or Rusto fats, but not as fat as Pink Dots. They are well-suited for filling in large areas.